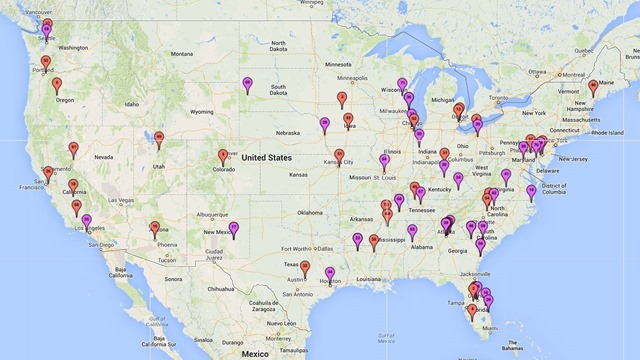 74 “School Shootings” since Sandy Hook. Really? When I see a chart this far out of skew, I start to wonder. Are the numbers being charted the same as previous numbers. In other words, what are we calling a school shooting? I also saw this article that stated there were 74 school shootings since Sandy Hook. You can also see a map in the Washington Post.“Of the shootings, 35 took place at a college or university, while 39 took place in K-12 schools”. This is even more dramatic, as the Examiner only stated there were 7 “school shootings” last year. Here is the table from the link that posted there were 74 school shootings. Here is a map for those who are visual. I am not one to take something at face value simply because someone states it, so I Googled each of the “school shootings” above. Before starting with my findings, you have to cross off either #68 or #69 on the list, as there were not two shootings in two consecutive days at Paine College. You should only count one of the incidents, as there was only one incident. That leaves us with 73 incidents to investigate. Shooting #1 – On sidewalk outside of a church that hosts the Apostolic Revival Center and Christian School. Scary? Yes. School Shooting? No. Shooting #15 – Student shot off campus, runs back to campus at Elizabeth City State University. CITE: “Two teenagers are charged in the off-campus shooting of an Elizabeth City State University student”. Shooting #20: Mother kills self and two sons in home. Sons were “students”, but not on campus. Shooting #58 – Shooting of student in off campus apartment complex (Studio Green Apartment Complex). There is also a shooting that took place in a mall that houses a community college in addition to other tenants. Not technically a school shooting. This takes us down to a maximum of 67 “incidents” that took place on a school campus. The next thing we have to do is define what a “school shooting” means. Does it mean a madman hunting down students only? Do we include gang related offenses or disputes, in which a specific person was targeted and just happened to be shot on campus. Do we including incidents in school parking lots that are not related to the school at all (including a mother gunned down by her estranged husband after dropping off kids and a gunman escaping police who had a shoot out at a community college)? And do you include self-defense shootings, like the teacher shooting non-student assailants at Martin Luther King Jr Elementary School)? And what about things happening on a school yard after hours? Are these all “school shooting”? I would venture a no on most, if not all of these. Your mileage may vary. Now, let’s look at incidents that might be called a school shooting. First the targeted shootings. Shooting #2: Student shoots at two students who bullied him. Zero deaths, zero injuries. Shooting #30: Student shoots two people that had been bullying him and his teacher, then shoots himself. Evidence of bullying in other articles. Two deaths (the shooter and teacher), two injured. Shooting #19: Six people killed (including the gunman). June 7, 2013, shooter kills his brother and father and then goes to Santa Monica college where he has a shootout with police in the library. Six dead (including the gunman), four injured. Three of the dead (including the gunman) died on the campus. Shooting #73: 1 person killed and two wounded. Shooter stopped by pepper spray while reloading his handgun. NOTE: I am not going to glorify the shooters by calling them anything other than shooters. Looking at the list, we had 6 incidents in the last year and a half that we might classify as a “school shooting” (person comes to school with intent to harm, especially if shooting random victims) . This is close to the Examiner’s numbers. Of those, there are only 2 that could have been like a Sandy Hook (although both were at Universities and the shooters were stopped or killed rather quickly). Some incidents that are not “school shootings”, including some that happen at night, incidents in parking lots, fights and some incidents not even on school property, show up in the list. The data set is incomplete, as you can only find what is searchable on the Internet. You will naturally find more “incidents” this year, as the media is quick to call something a school shooting and is more apt to report on every “incident”. What I like here is the fact the chart is all over the board shows how sporadic the data is and strongly suggests the data set is more and more incomplete as we move back in time. 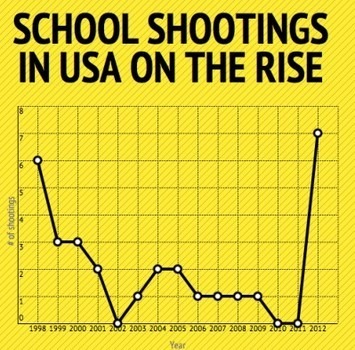 It also shows spikes when mass murder school incidents have happened and illustrates how rare they really are. Here is how I look at this. It is tragic when people are killed. Especially tragic when it is children and even more so when it is Elementary School children. 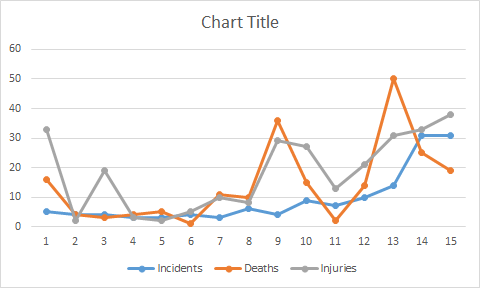 The number of ‘’”incidents” may be on the rise, but, if so, it is only slightly. The majority of press on “rising incidents” uses “incidents” we would not normally classify as a “school shooting” (like man killed in a school parking lot at 2 AM after altercation). NOTE: This does not mean we should not do anything about it, but we should be sensible and not panic and knee jerk into another stupid direction. The number of mass murder type incidents is not on the rise. These, like Columbine and Sandy Hook, are the ones that should really scare us, as they are individuals intent on causing a huge amount of harm to innocent victims. If we objectively look at the ‘’”problem”, we should notice that our children are not in real danger. School shootings are extremely rare incidents. When there is a school shooting, it is normally individuals targeting people they dislike for some reason, including bullying, gangs, bad grades, etc. In these instances, like any other assault or murder, it is an issue between two people and not some mass murdering clown. As for the list that started the topic, I find it to be an unscientific bit of tripe. At best, it is an emotional argument crated by someone trying to show his emotions are justified. At worst, it is a bold faced lie. You decide.